Brown bread was just one of the many scrumptious baked goods that my Irish grandmother, affectionately known as "Mamo," regularly produced in her tiny kitchen in Elmhurst in Queens, New York. Mamo emigrated from Ireland in the late 1940s and brought with her a wealth of recipes for delights such as lemon cookies, apple pie, custard tarts, Turkish delight, sultana cake, tipsy cake, spotty dog (which was a soda bread), and a yellow cake with chocolate frosting that we have never been able to reproduce and for which the recipe was never written down. Her recipe for brown bread is as basic as it gets. I've tried several recipes from as many sources, and they all seem to simply tweak the amount of each ingredient; the results are pretty much the same. My dad, an engineer who was a lifelong fan of hearty bread and a baker of same for the past few years, could not resist fiddling with the amount of the ingredients, either. He saw fit to email me with changes to Mamo's various recipes that involved increasing the amount of buttermilk by an ounce or two or changing the brand of flour. 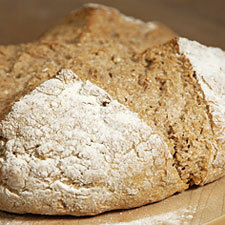 Every Saint Patrick's Day, I make a big round loaf of Mamo's brown bread. Slathered with butter, it makes for a filling breakfast with a big cup of coffee. It makes me think about Mamo and my other Irish relatives, too. As a kid, I used to think Mamo was, like, a patron saint or something. She certainly was very religious (we kids said she was "holy"). 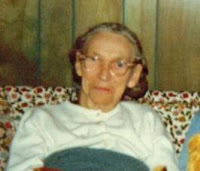 When I visited her home, I slept on a fold-out cot in her bedroom, and when I awoke, I'd see her sitting up in bed, holding a well-worn, black prayer book, a cup of tea brought by my grandfather at her side. All I would hear is the sibilant whispering of her morning prayers. A painting of the Last Supper arched across the wall behind her. Oddly, for such a pious woman, she taught me only two Irish phrases: Póg mo thóin (kiss my...erm, backside) and Go hifreann leat! (go to...uh, heck). I'm glad I got to bake up a loaf of this bread at least once in Mamo's company. She showed me how to knead the gluey mass (today I toss it into the Kitchen Aid mixer and let the dough hook do the work) and how to slash it twice at right angles (according to Mamo, to bless it; according to my mom, who baked this same bread frequently, to make it easier to cut). I regret, however, that I never asked Mamo to teach me to knit. Wow! What a knitter she was...Aran sweaters, boucle skirt-and-top sets, adorable cabled cardigans for children...and here I can't even cast on and can barely sew a hem. Go raibh míle maith agat! (May you have a thousand good things!) Here's her recipe. The bread should sound hollow when tapped on the bottom after removing it from the oven. Be sure to put the bread on a cooling rack or lean it at an angle against the wall after you take it out of the oven, otherwise the bottom of the bread will get soft as it gives off moisture. Store it when cool inside a paper bag, not plastic. To make soft dough mix with wooden spoon. Knead it a few times on board or table with flour spread on it. Bake in cooking tray in oven at 400. (Sprinkle flour on tray.) You know how to flatten it on tray and make cross to make four squares.